It was love at first strum. Three years ago during SXSW 2016, Gina Chavez played an early evening set at Sidewinder. Knowing her reputation alone, I showed up as a newbie. An hour later, I walked away a fan. With a stylish and exuberant brand, melding samba, cumbia, and Latin influences, Gina Chavez has rocketed to the upper echelon of Austin’s music scene. And with her first record in four years, she’s refined her sound into something groovy, moving, and magical. Unlike most “locals,” Gina Chavez is a born and raised Austinite. She discovered a knack for singing during elementary school. But it didn’t become serious until she started to hone her talents at McCallum Fine Arts Academy. Then she discovered Tony Price at The Continental Club, during her stint at The University of Texas. That’s when she felt led to pick up a guitar. Songwriting soon followed and led to her first album “Hanging Spoons,” a tight folk record full of poetry, soft strumming, and Chavez’s haunting vocals. Her musical style drastically changed after a semester in Buenos Aires introduced her to the world of Latin sounds. Her newfound Latin inspiration led to a second full-length record, 2014’s “Up.Rooted.”A head-spinning melange of Latin rock, steamy cumbia, and mystic vocals, the album vaulted Chavez to international acclaim. 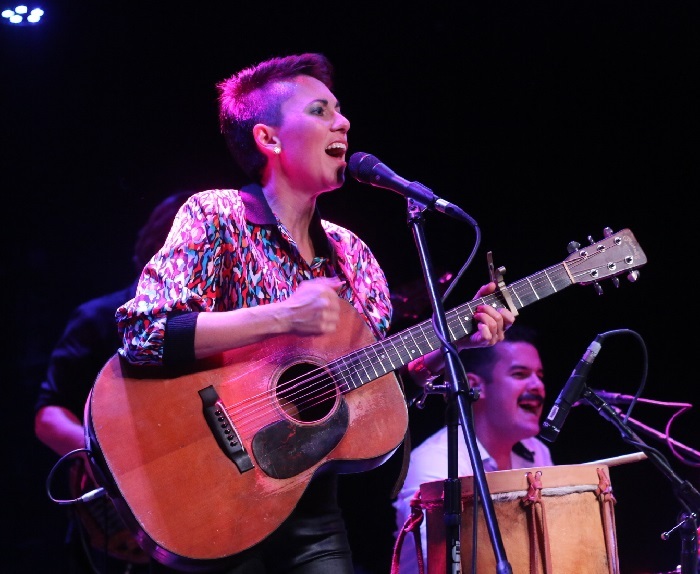 From appearances at major festivals, to several Austin Music Awards, to an incredible NPR Tiny Desk concert, “Up.Rooted” launched Chavez as an ambassador of Austin music on the national stage. Live, she’s even more impressive. Deftly weaving between soul-crushing ballads and body-shaking rhythm, Chavez ignites heartstrings and dancing shoes in equal measure. Her defining trait is pure passion and a sense of fun. Every song, from the velvety slow burn of “Firewater” to the Latin dance jam “Siete-D,” is delivered with a genuine smile and heart for adventure. But then, everything slowed to crawl. While Chavez was still playing shows, volunteering for several local musician advocacy groups, and running charities, new music was nowhere to be found. At long last, four years after the release of “Up.Rooted,” Chavez has a fantastic followup. A notable departure from the bilingual Latin vibe of her previous effort, “Lightbeam” trades congas and cumbia for hollow body guitars, R&B, and passionate soul. The change is obvious from the first note. The record’s opening track, “It’s Hard to Love a Woman,” opens with the artist’s signature stunning vocals atop spare jazz guitar. It blossoms to a soul jam more Alesia Lani than Grupo Fantasma. At the outset, it’s clear Chavez is unapologetically in love and unafraid to share that fact with the world. “Heaven Knows” continues the vibe with shades of her earlier sound. 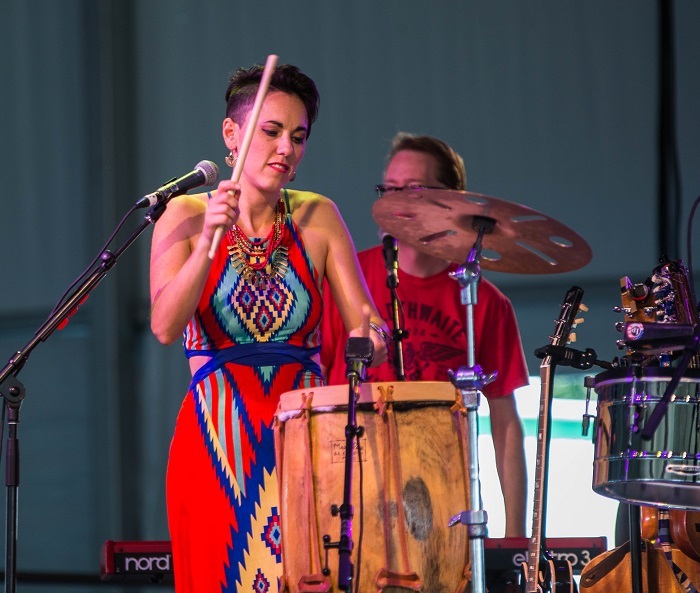 Smooth, groovy, and peppered with Latin drum hits, shakers, and key vamps, the tune is a celebration of Chavez’s recent marriage to her longtime partner and now wife, Jodi Granado. The culmination of 12 years of hiding, wondering, and finally celebrating, the song serves as the soundtrack to their nuptials. Add to the mix “Miracle,” an exploration of Chavez’s Catholic faith, with the lush yet bouncy harmonies of the title track, and you have an EP deserving of multiple plays. Luckily for the world at large, Chavez is more than an exceptional artist. She’s an exceptional person with a heart for service and the Austin music scene. Over the years, she’s been involved with Black Fret, Health Alliance for Austin Musicians (HAAM), The SIMS Foundation, and has served as a board member for Austin Creative Alliance. Chavez and her wife are also founders of the Niñas Arriba charity. The foundation funds college education for impoverished girls in the worst parts of El Salvador. After years of fundraising, Niñas Arriba is celebrating its first four college graduates, none of whom would have the chance to even see a classroom without this heartwarming program. Spend five minutes with Chavez, and you’ll understand the love behind these good works and great music. Born to make bodies move and hearts swoon through her passionate, positive music, Gina Chavez continues to be a pillar of the Austin community. And with a new record paving the way for more music to come, expect great things from Austin’s reigning queen of Latin soul. The digital album release for “Lightbeam” is Oct. 26, 2018. For more information on Gina Chavez, including social media and tour information, visit ginachavez.com. To learn more about Niñas Arriba, visit ninasarriba.wordpress.com. What’s your favorite Gina Chavez song, show, or moment?